Take a wild guess as to what date I removed the nofollow attribute. It was on August 22. Within one week, the daily number of comments on SiteFever rose 716%! You may be thinking that some sort of change in traffic caused this commenting explosion, but that doesn’t seem true. My daily unique visitors have been increasing by about the same amount the entire time. Whether this change is a direct result of removing the nofollow attribute or not, we may never know, but the results do seem to point in that direction. In efforts to continue additional commenting, I will be implementing some additional features to this blog in the near future, so stay tuned! Interesting data and point – like your analysis and presentation on the site! Thats a huge increase, but I’m curious if that was because of your release with your release of “Blog Traffic Made Easy” which is around that date? I’d like to see my own stats laid out like this, did you have to gather it manually or do you have some special plugin? That artice could have had something to do with it because there were a LOT of comments on that post. 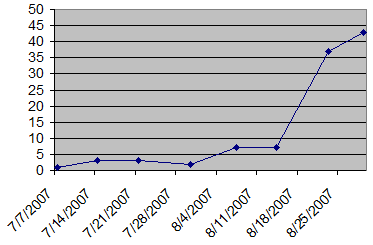 To get those stats I just logged in to my WordPress admin panel and clicked “Comments” I entered each date and its number of comments in Excel and created the chart. This is something I have been considering doing to my blog for ages. I just can’t make up my mind. I have read that removing this nofollow attribute can possibly hurt your search engine rankings. what are your thoughts on it? It is true that the search engines can bump you down if you link to a bunch of poor sites, that’s a big reason why people throw around the nofollow attribute all the time. My outlook is that without reader participation on your blog, you’ll never build up a good reader base. Without a good reader base, it doesn’t matter what your search engine rankings are like. It all boils down to the ultimate mystery of the universe- Who to blog for, the search engines or your visitors. I think that you made a smart move John. Having active readers are one of the main success factors when blogging and even if it would hurt your search engine rankings then would it really matter? Having a “make money online” blog will often not bring in the most traffic from SEs anyway (I’m guessing here). What are your stats when it comes to traffic sources? SEs, Referral, Direct ? I’ll be posting that information tomorrow, after I have the complete month’s stats together.